Well my friends, we’re getting closer to wrapping the old girl in some shiny new cement siding with AZEK accessories. 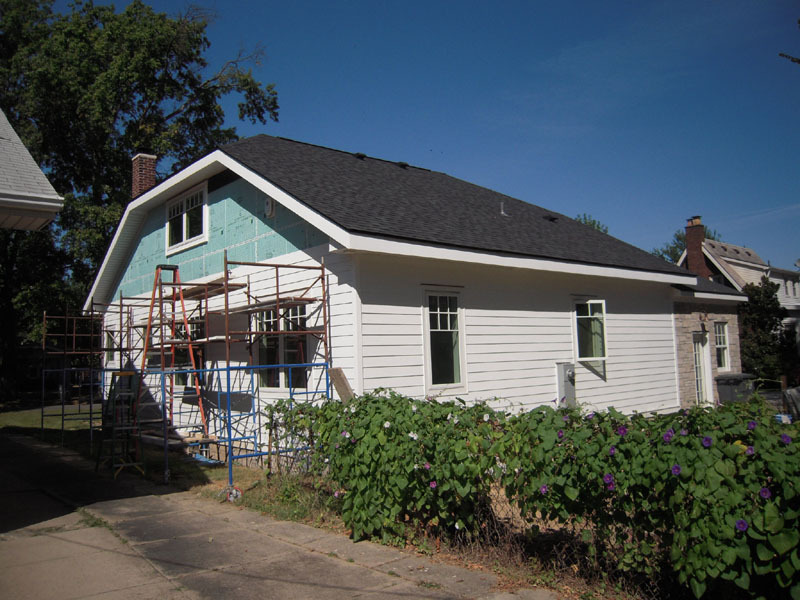 I put the first piece of siding on July 31st and I’ve worked at least 10 hours every day since on this project. That’s how slow I am. So now we’re working on the street side – where God and everybody passing by can see me fumbling and stumbling about. And I do stumble due to the metal plate in my ankle that makes me slightly wanting in the off road category. 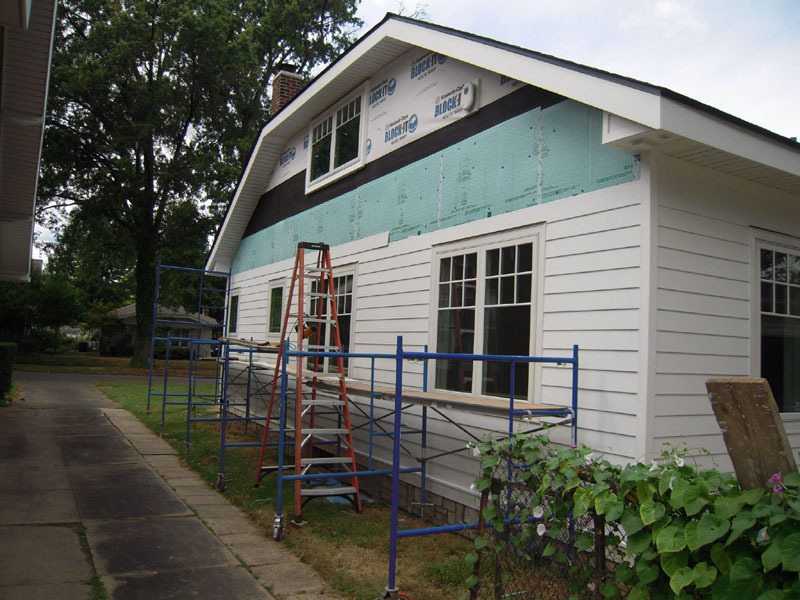 To prepare for the final walls I went ahead and painted the rest of the siding – it’s more than I need – but there’s always the garage to be sided in a future project. 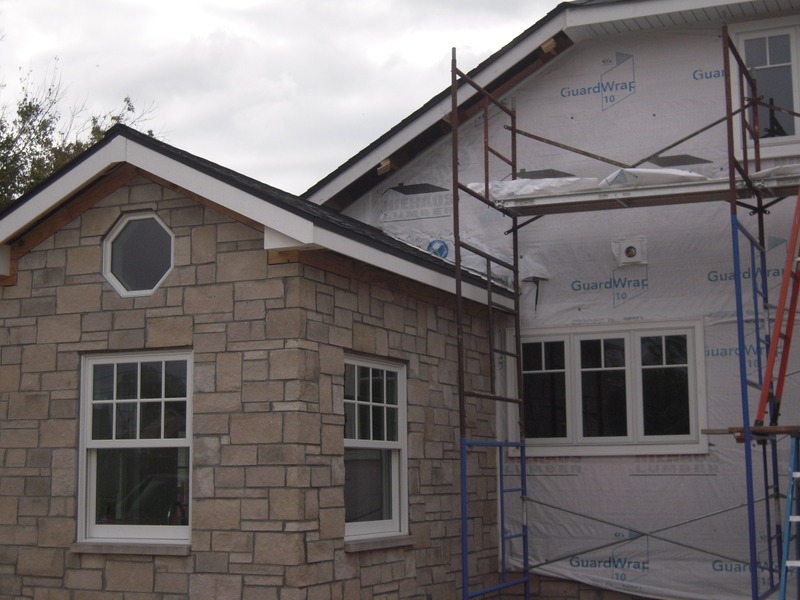 The front was quick to install as it has a big window – and it’s one story high. 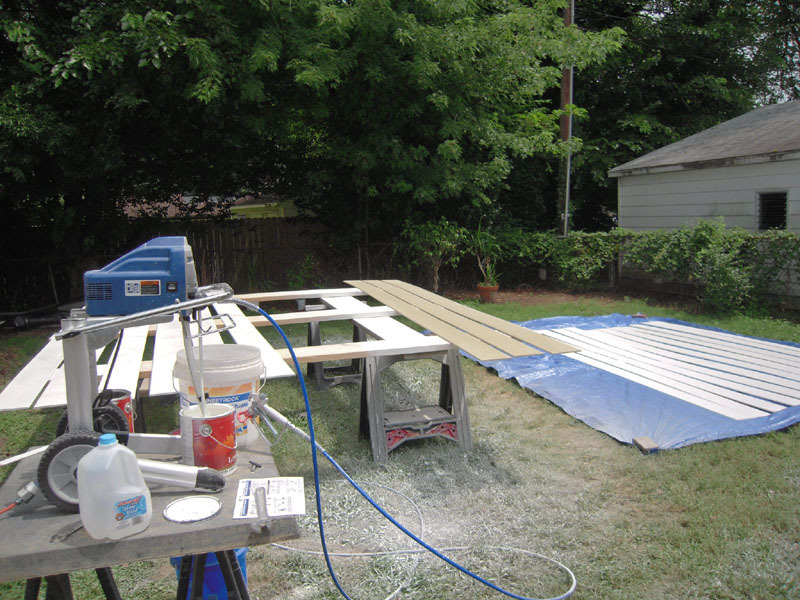 Even though the Hardie siding is factory primed, you have to coat every cut made. I would make the cuts, sand it down and coat the raw edge front and back. 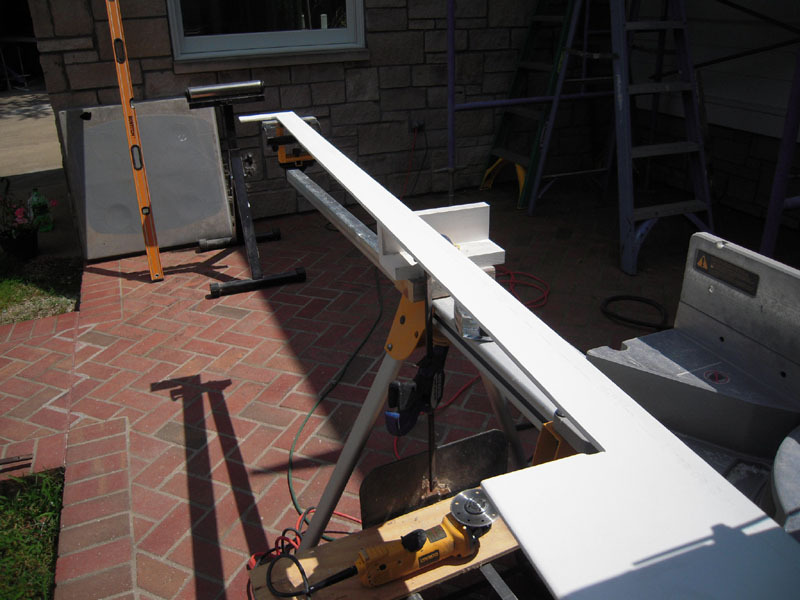 Once up to the roof intersection trim pieces needed to be made to carry the trim around the eave light boxes up to the soffit overhang. 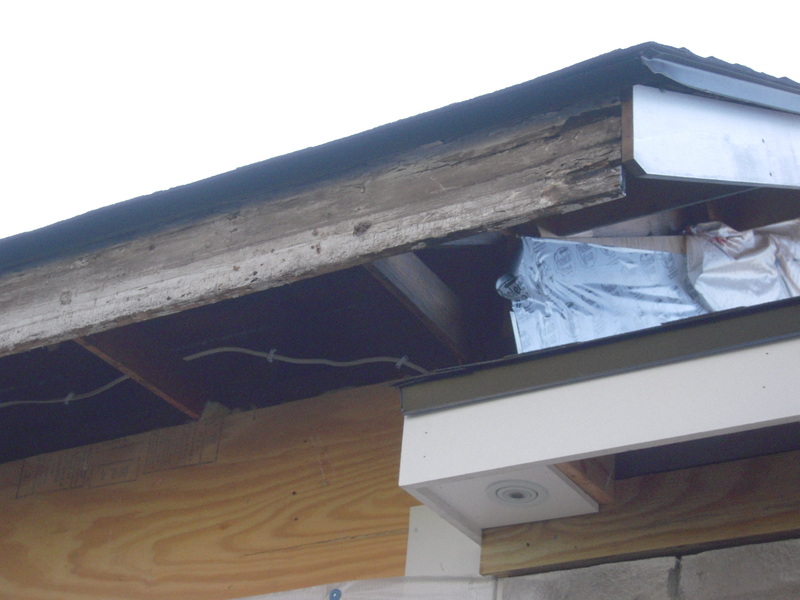 The box has an LED down-light and a weatherproof electric receptacle. I love making doodads for trim pieces. 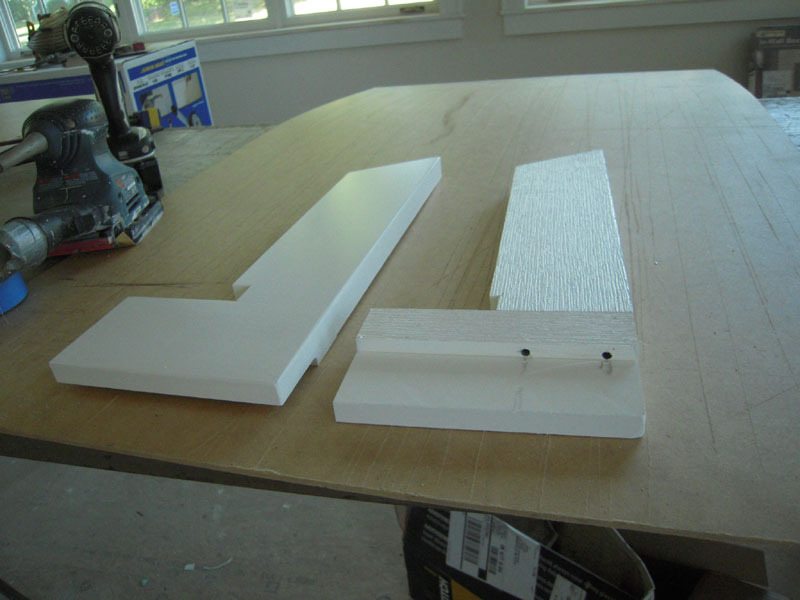 Here is the front and back of the light box trim pieces. Stainless steel screws and PVC glue hold these AZEK pieces together. 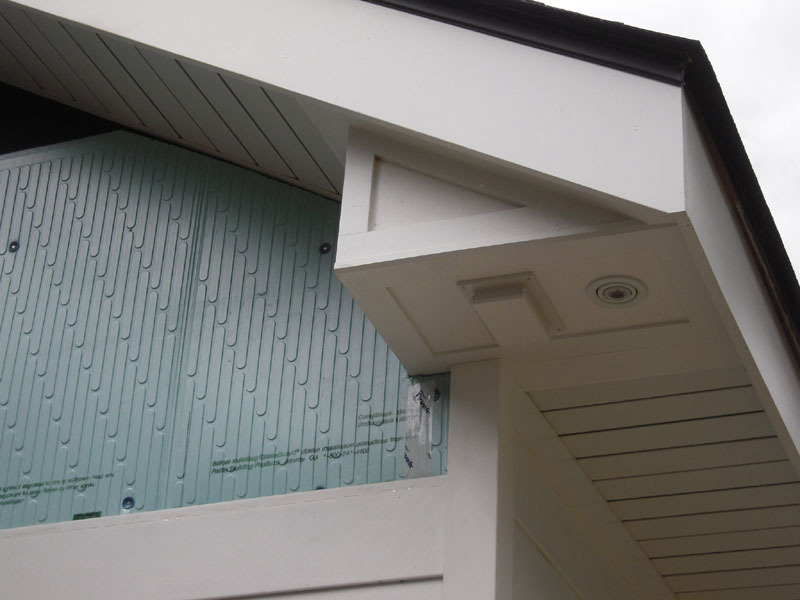 Those pieces get installed around the light box to transition the trim to the soffits. 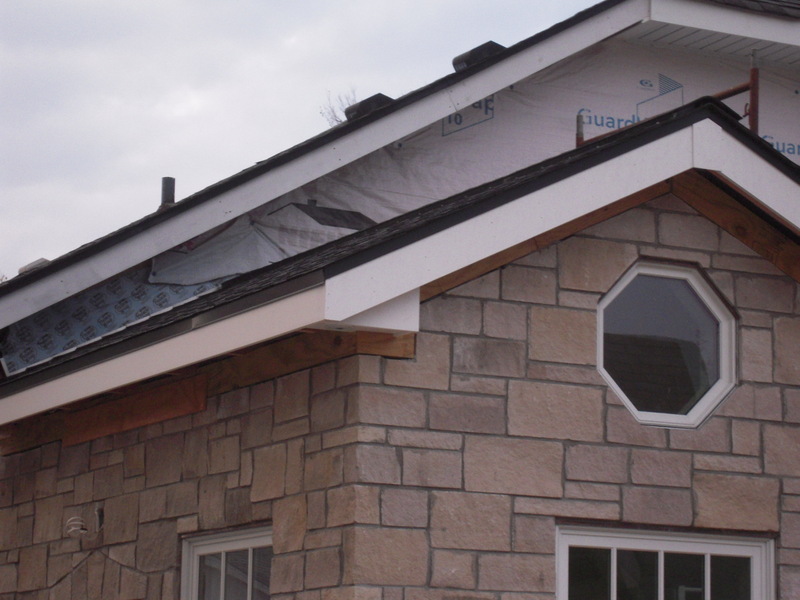 The rabbet overlaps the siding. 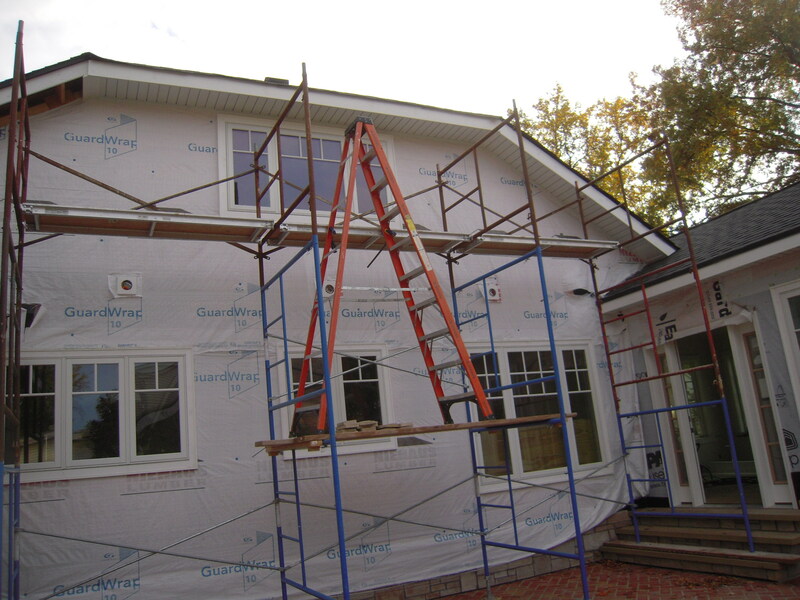 Another level of scaffolding goes up. I’ve learned my lesson and make sure safety first. It takes time, but a lot less time (and money) than a hospital stay. 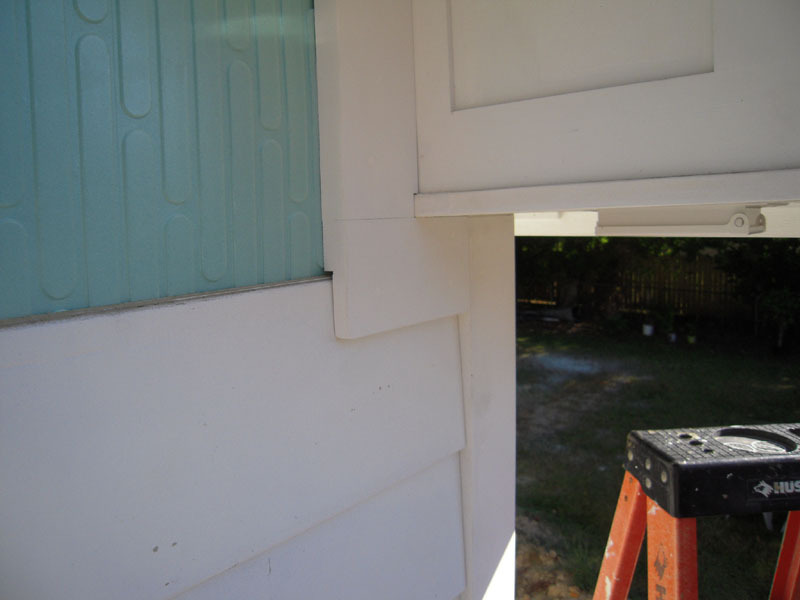 The problem is the Hardie siding is it’s 12 foot long and very brittle. 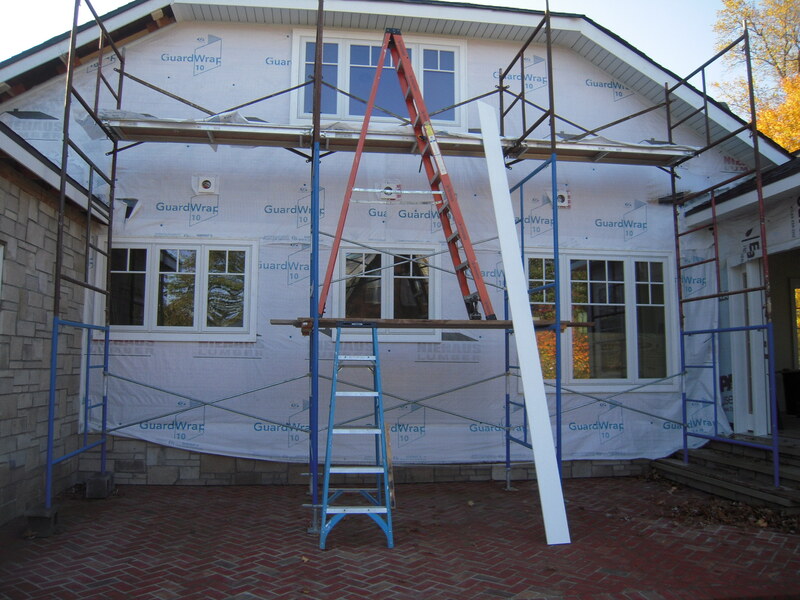 I would make the cuts and prop it up against the scaffolding – run up the ladder and hope it was still there. I only lost one to the wind, so I can’t complain. 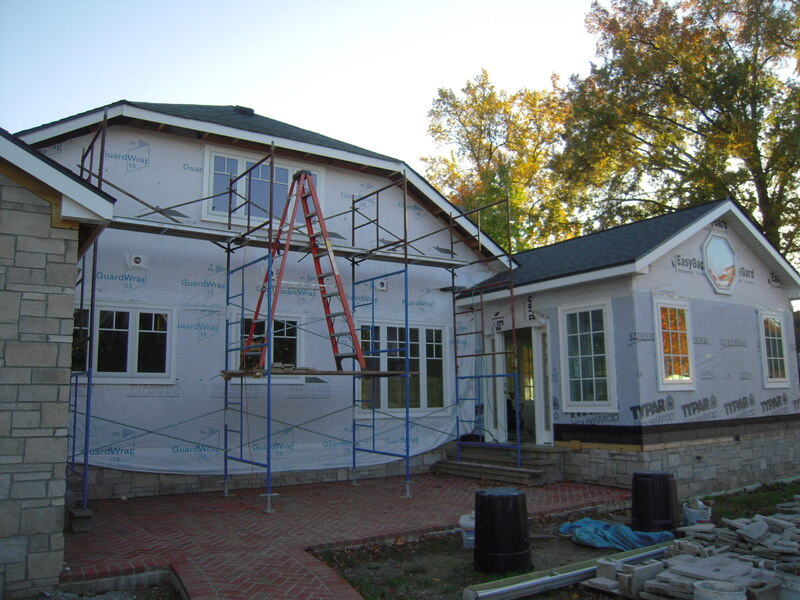 We’ll wrap up this outside project in the next post. Then we’ll go inside and get to work. We have been pretty lucky weather-wise in Southern Indiana. No rain for 20+ days. 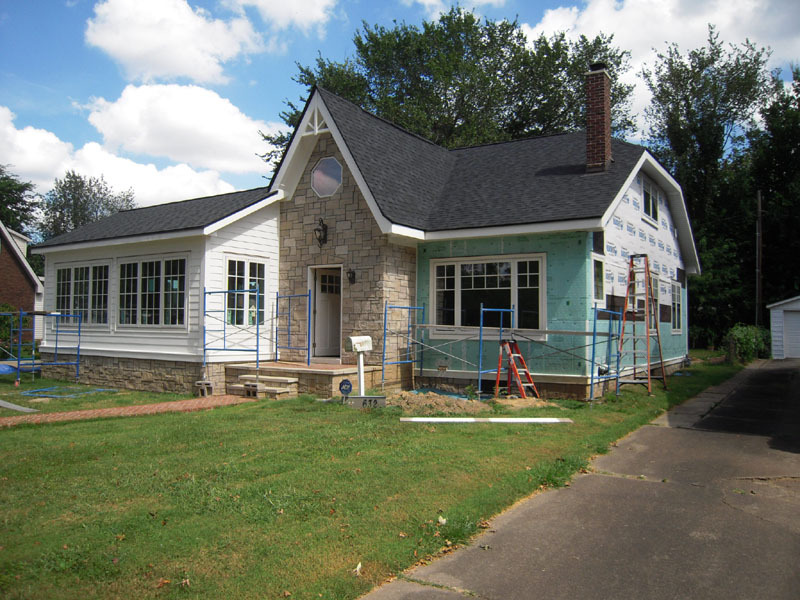 Not so good for the crops – and temps in the mid 90’s, but good weather for a siding project. As a matter of fact – it’s slightly raining today, so a perfect day for a blog post. 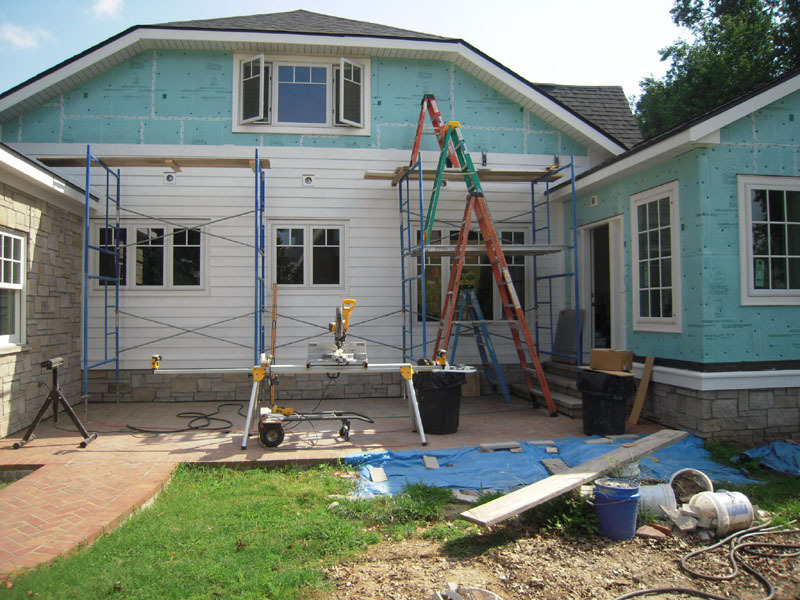 I started on the back of the house for a couple of reasons. 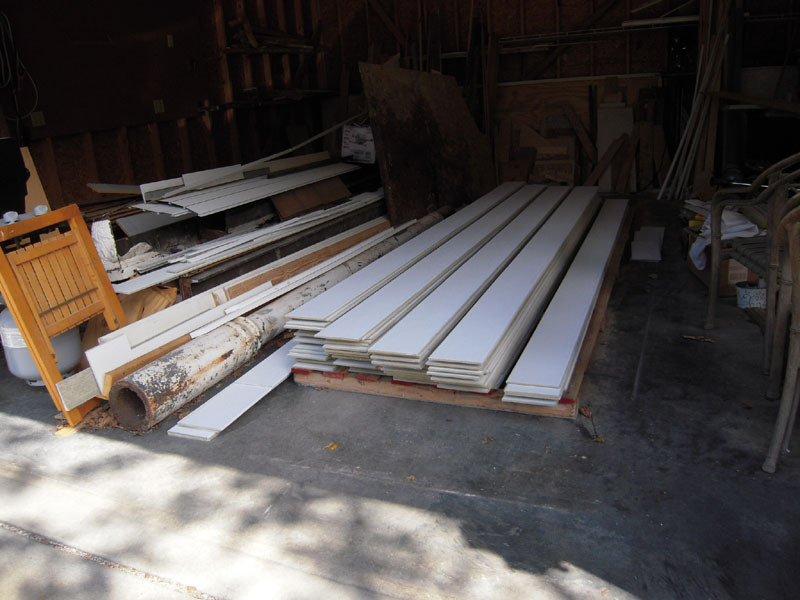 One – it’s a single story wall with lots of notches and cuts to be made in the siding. 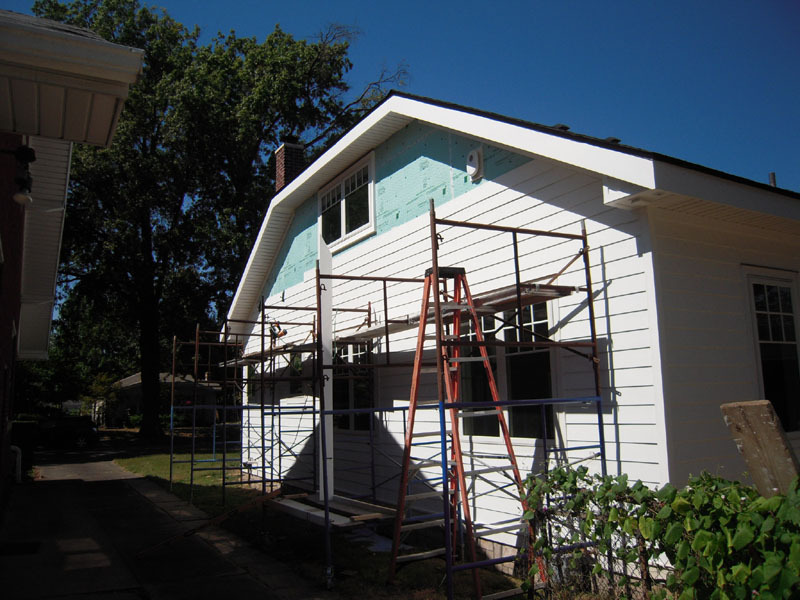 Since I’ve not used cement siding – nor sided a house before – I thought this was a good place to start. 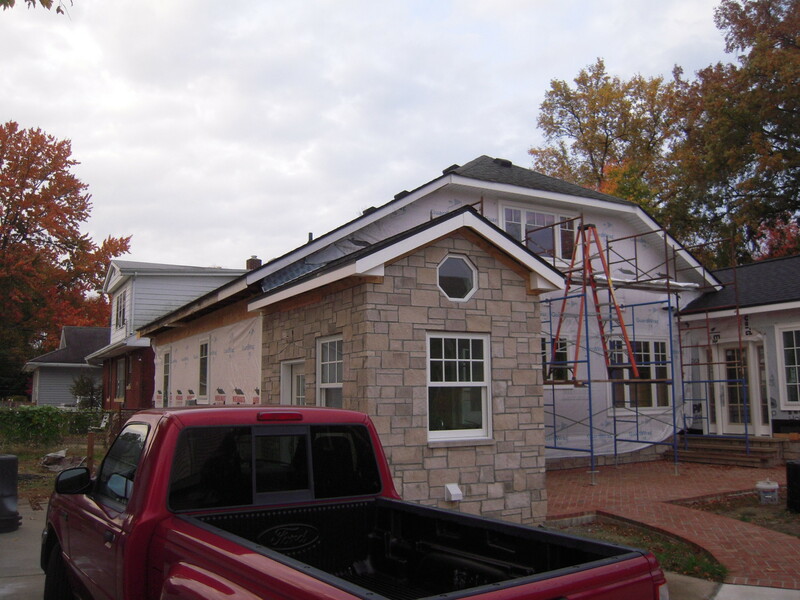 It’s really pretty easy – even for a one person installation crew. I’m using the Gecko Siding Gauges. 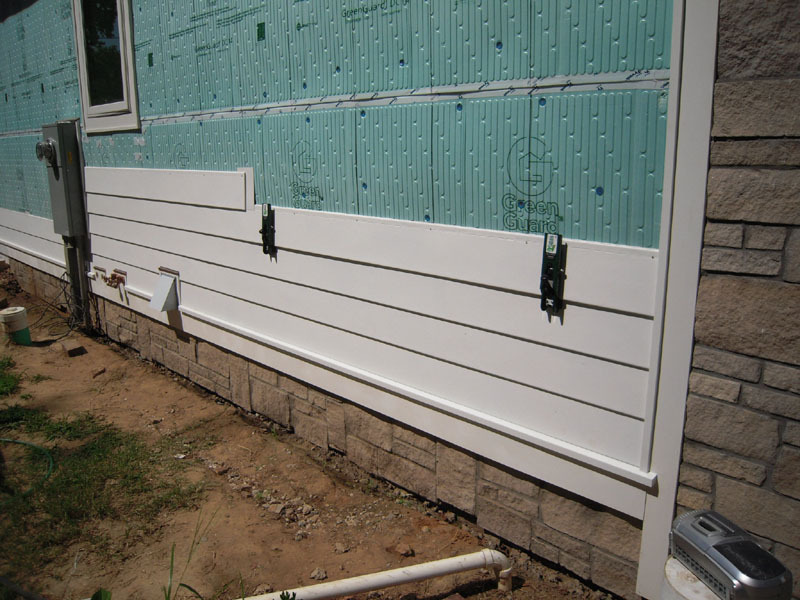 These hold the siding at the correct reveal and keep everything in place while you nail them to the wall. Of course, a guy’s gotta eat. My wife was kind enough to drop off some chicken breasts – fresh from the refrigerator from home. Problem is I don’t like ice-cold chicken and have no way to heat it since a kitchen is non-existent. 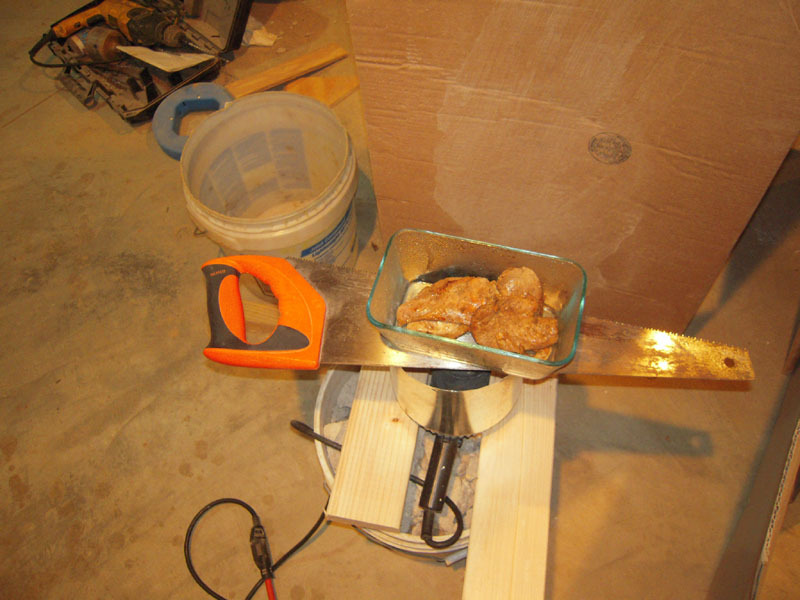 So, like any DIY’er I got out the heat gun, a cut off piece of 6″ duct, a hand saw and had a handy chicken warmer in no time. After lunch it’s back to work. Here’s the set up for the airless paint sprayer. 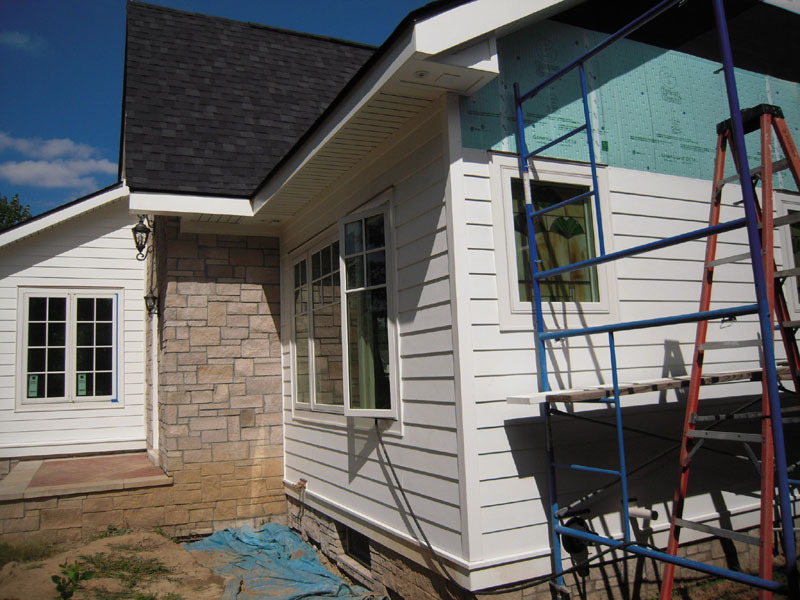 The Hardie siding is available pre-finished or pre-primed. I chose the primed because when I bought this 3 years ago I had no clue what color I would paint it. 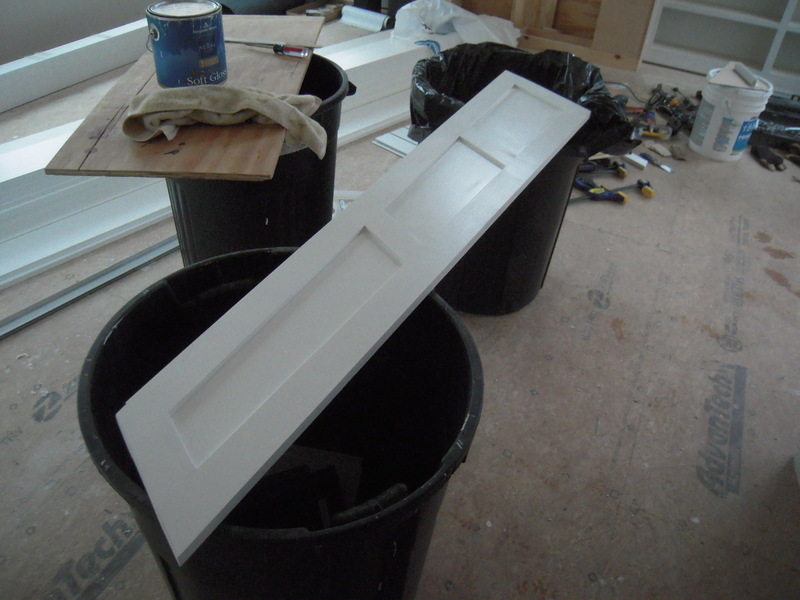 I sprayed one coat before installing. I do about 70 twelve foot pieces per session. I used Low Luster Benjamin More OC-57 White Heron. Once installed, I’ll hand paint the final coats. 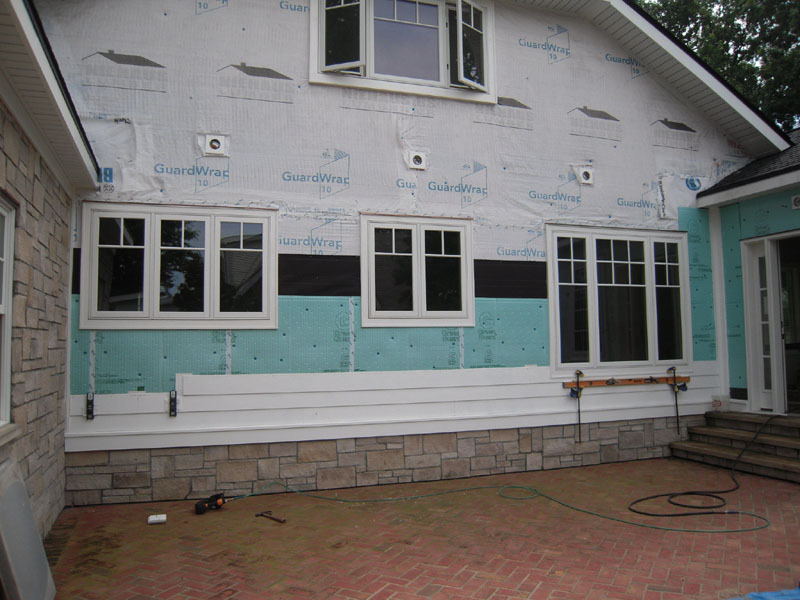 I have eight walls that will have siding – this is wall #2 on the patio side. It’s by far the most complicated with windows and lights and roof intersections. Plus it’s two stories high – this will take a while. To cut the notches for the windows I used the small angle grinder with a diamond blade. 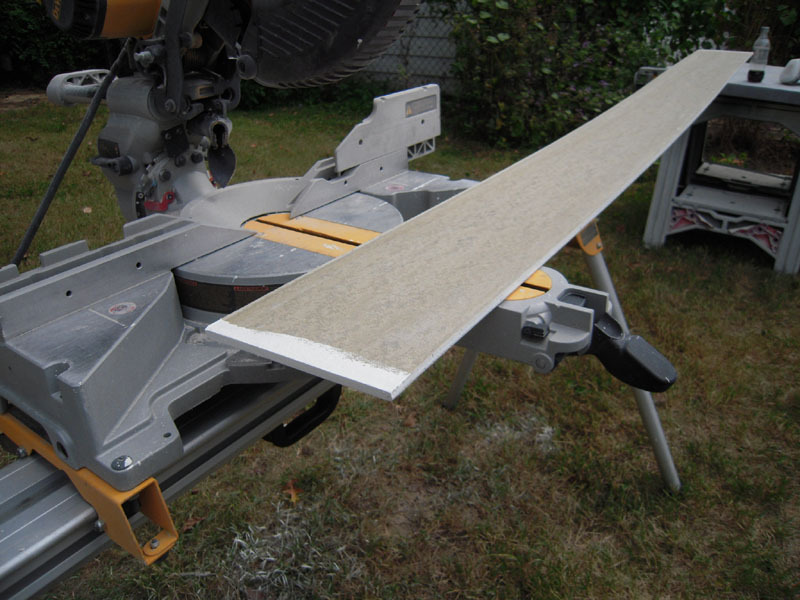 It cuts very smooth and straight – but throws out a cloud of dangerous silica dust. I always wear a P-95 dust respirator when cutting the notches. 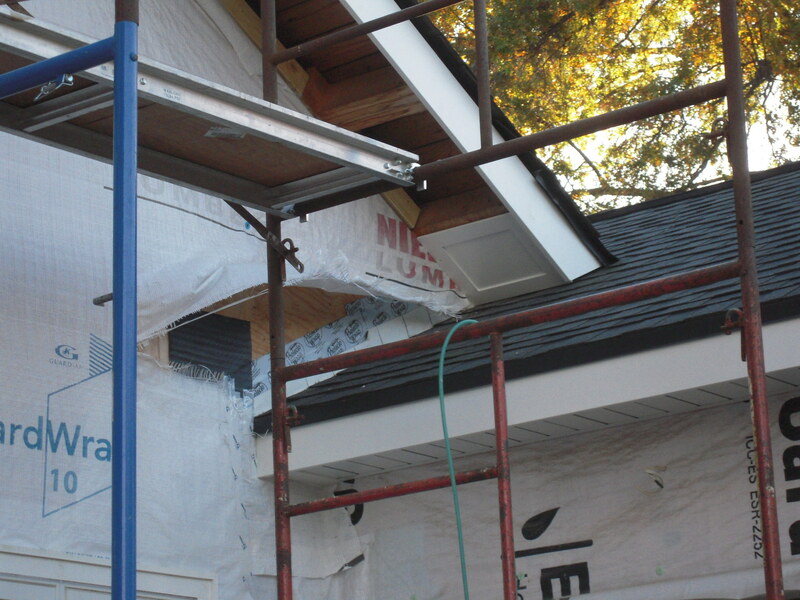 Here the thin siding notch piece is supported by a 6′ level while the adhesive/caulk cured over a couple of days. 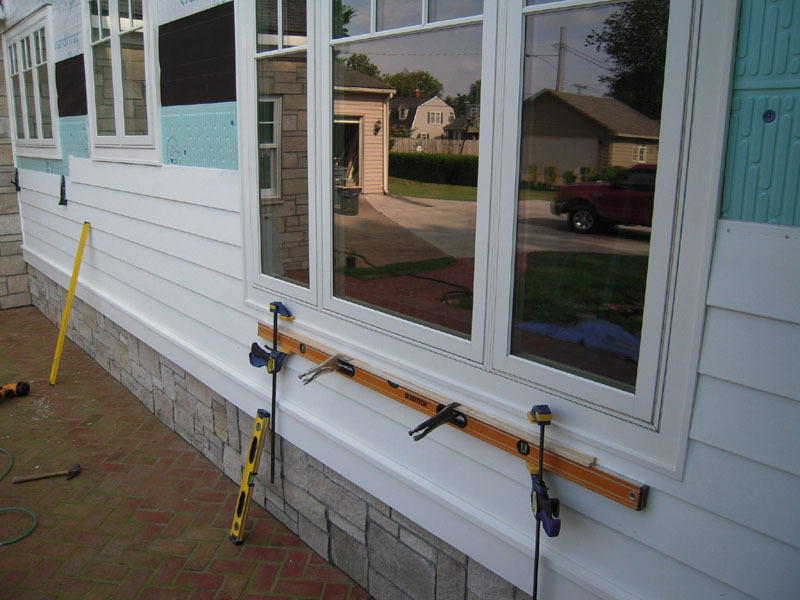 I’ve used many caulks before, but by far the best I’ve found is Solar Seal #900. It’s easy to use and it’s my go-to caulk from now on. After six years I’ve figured out the scaffold layout. Two sections high with 4 walk boards combined with the scaffold planks makes this safe and easy – well – except going up and down the ladders countless times a day. 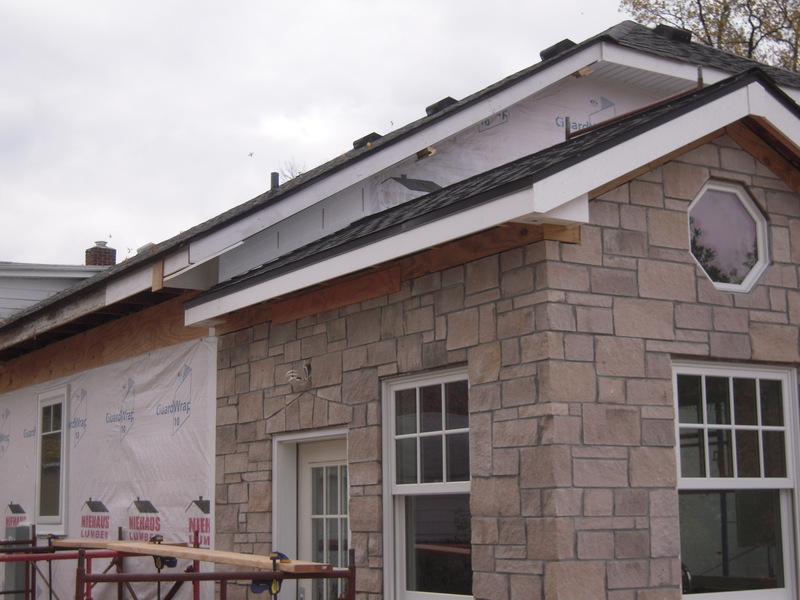 Hang in there – we’ll wrap this building up before winter, I promise.